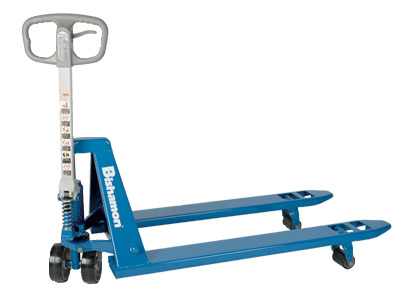 Bishamons BS Series Hand Pallet Trucks are easy to use and exceptionally durable, with capacities of 2,500 to 6,500 lbs., fork widths of 20 1/2 or 27 in and fork lengths of 32 to 48 in. All Bishamon products are designed and constructed for lifting and moving applications under the toughest working conditions, offering years of trouble-free operation. They reflect over 50 years of proven Bishamon performance. Lift height up to 8 in. Low profile model lowers fork height to 2 in.